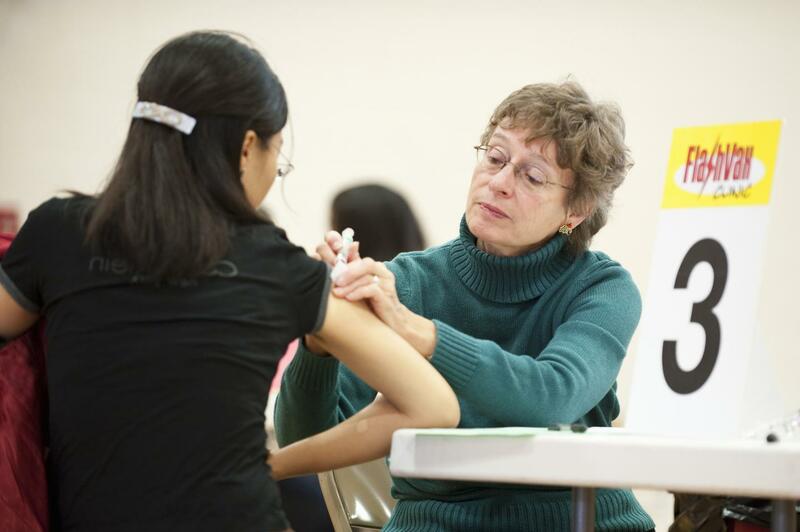 MADISON, Wis. — During the 2014-15 flu season, the poor match between the virus used to make the world's vaccine stocks and the circulating seasonal virus yielded a vaccine that was less than 20 percent effective. While this year's vaccine is a much better match to the circulating seasonal strains of influenza, the shifty nature of the virus and the need to pick the viruses used to make global vaccine stocks well before the onset of the flu season can make vaccine strain selection a shot in the dark. That process — dependent on the careful selection of circulating virus strains and the identification of mutations in the part of the virus that recognizes host cells — could soon be augmented by a new approach. It would more precisely forecast the naturally occurring mutations that help seasonal flu virus dodge the vaccine. Writing this week (May 23, 2016) in the journal Nature Microbiology, a team of researchers led by University of Wisconsin-Madison School of Veterinary Medicine virologist Yoshihiro Kawaoka describes a novel strategy to predict the antigenic evolution of circulating influenza viruses and give science the ability to more precisely anticipate seasonal flu strains. It would foster a closer match for the so-called "vaccine viruses" used to create the world's vaccine supply. The approach Kawaoka and his colleagues used involved techniques commonly employed in virology for the past 30 years and enabled his group to assemble the 2014 flu virus before the onset of the epidemic. "This is the first demonstration that one can accurately anticipate in the lab future seasonal influenza strains," explains Kawaoka, a UW-Madison professor of pathobiological sciences who also holds a faculty appointment at the University of Tokyo. "We can identify the mutations that will occur in nature and make those viruses available at the time of vaccine (virus) candidate selection." Influenza depends on its ability to co-opt the cells of its host to replicate and spread. To gain access to host cells, the virus uses a surface protein known as hemagglutinin which, like a key to a lock, opens the cell to infection. Vaccines prevent infection by priming the immune system to create antibodies that effectively block the lock, prompting the virus to reengineer the hemagglutinin key through chance mutation. "Influenza viruses randomly mutate," notes Kawaoka. "The only way the virus can continue to circulate in humans is by (accumulating) mutations in the hemagglutinin." To get ahead of the constant pace of mutations in circulating flu viruses, Kawaoka's group assembled libraries of human H1N1 and H3N2 viruses from clinical isolates that possessed various natural, random mutations in the hemagglutinin protein. The viruses were then mixed with antibodies to weed out only those that had accumulated enough mutations to evade the antibody. Because the sources of the viruses were known, the patterns of mutation could be mapped using "antigenic cartography." The mapping, says Kawaoka, identifies clusters of viruses featuring novel mutations which, according to the new study, can effectively predict the molecular characteristics of the next seasonal influenza virus. Such a prediction, says Kawaoka, could then be used to more effectively develop the vaccine virus stockpiles the world needs each flu season. Each year the World Health Organization (WHO), comparing genetic sequence and antigenic data, makes recommendations about which circulating strains of influenza will make the best matching vaccine. The method described by Kawaoka and his colleagues is conceptually different in that it mimics the mutations that occur in nature and accelerates their accumulation in the critical hemagglutinin protein. "Our method may therefore improve the current WHO influenza vaccine selection process," Kawaoka and his group conclude in the Nature Microbiology report. "These in vitro selection studies are highly predictive of the antigenic evolution of H1N1 and H3N2 viruses in human populations." The study was supported by grants from the Bill & Melinda Gates Foundation, the National Institute of Allergy and Infectious Diseases, the Japan Science and Technology Agency, the Japan Initiative for Global Research Network on Infectious Diseases and others. This research was supported in part by a grant from the National Institute of Allergy and Infectious Diseases (NIAID) Public Health Service Research Grant and NIAID Contract HHSN266200700010C.